Complete online intake questionnaire form for Consumer Fraud Claim. We prepare paperwork & documents. We litigate on your behalf. 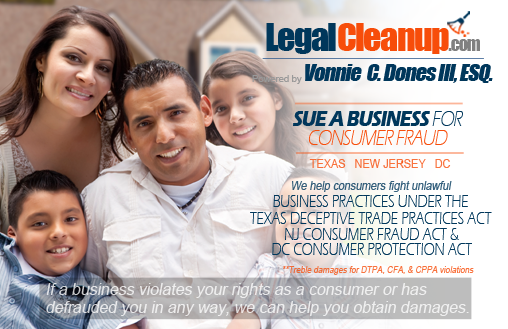 Texas, New Jersey & Washington, D.C. Consumer Protection Lawyer Providing Consumers With Protection From Fraudulent and Deceptive Business Practices. Have you paid a contractor for work that he or she did not do or did not perform properly? Did you purchase a car that suddenly stopped working or needs multiple repairs? Did a car dealer trick you into signing a financing agreement or trading in your car? If so, we can help you file a legal claim for consumer fraud. You receive peace of mind knowing that you have an attorney handling your lawsuit every step of the way. We will litigate on your behalf and seek up to three times the amount of your actual damages, plus your attorney’s fees and costs. Depending on the circumstances your case, we may be able to represent you on a contingency basis, at no cost to you. If you have been defrauded by a business, misled into an exploitative contract, or unlawful taken advantage of by a business, you may be entitled to three times the amount of your actual damages, plus your attorney’s fees and costs. Under Texas, New Jersey and DC law, a business cannot can deceive you into purchasing a good or a service. If a business violates your rights, you should obtain legal representation immediately. Provide you with a free initial consultation. Collect documents and evidence on your behalf. Seek judgment for treble damages, plus attorney’s fees and costs.